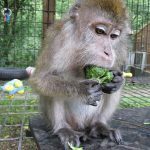 Samantha, affectionately known as Sammy, was a long-tailed macaque who lived at the PRC from 1992 until her death in 2010. Beloved by all, she had an easy-going personality and was warmly welcomed into several social groups during her time with us. She spent her final days in the company of Crunchy, another regal old gal whose idea of a good time was to groom her friend for extended periods of time, then present herself for a reciprocal session. We’ll miss you, old friend.